Fascinated by cubism in the fifties, I started with auto-didactic studies in France in the fifties and had my first success with colourful oil chalk drawings. After a pause of 30 years where I dedicated myself to the education of our four children and helped my husband with the foundation of his own company, I started a second career as a painter, taking lessons at the Vienna Public Art School and studying Art History and Romance at the University of Vienna where I got my master’s degree at the age of 71. I like working in several technics from fine watercolour flower paintings to collages, oil paintings of French gardens, graphics, ink drawings in black and white, to fantastic figurines, invented landscapes and abstract compositions in acrylic. In my artwork I want to express my joy of life and share it with the spectators in many countries where I like to travel. I got several awards in France and Italy. 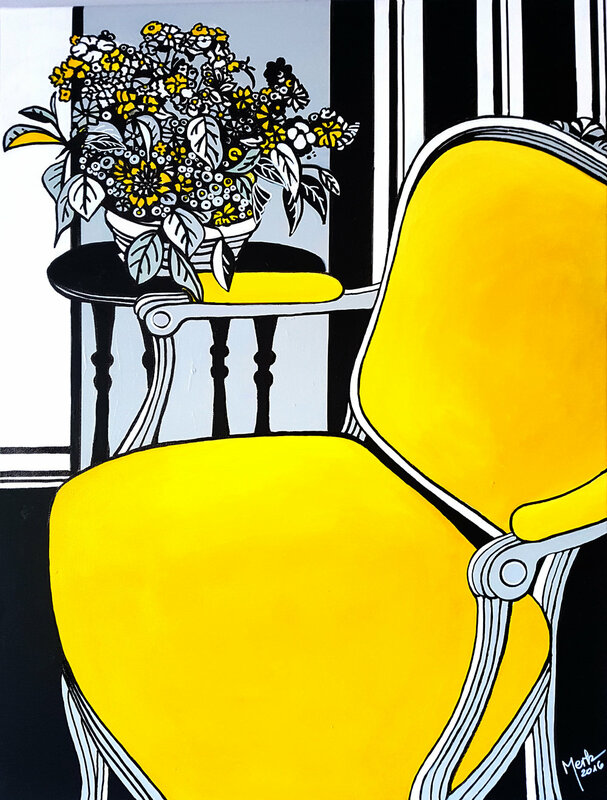 I got inspired by one of my earliest watercolor paintings to make this picture of a bouquet on a yellow background, whereby I reduced the colors to just yellow, grey, white and black. The result is an elegant setting between reality and abstraction where the emphasis is on the lines who are in a harmonious dialogue with the plain areas. In this work my cultural heritage of Viennese Liberty style (Jugendstil around 1900) meets with the Modern Art, which I studied during several trips to Paris since the fifties, thus creating a new personal reality. I would be very happy and feel encouraged and confirmed in my artistic research.And, of course, I would buy immediately a flight ticket to Dubai! As soon as I understood one day that the ability to create artworks is a God given talent, I felt that I had a great responsibility and I decided to take lessons with experienced good artists. I wanted to learn most possible technics to find out which one is most suitable for me to create artworks worthy of this high vocation. Thus art became for me not an instrument for political, social or religious confrontations, but an instrument to create a universe in which the spectator could relax and enjoy a world of beauty and harmony. I agree with the French painter Eugène Delacroix who said: “An artwork should above all be a feast for the eyes”. I get my inspiration from the observation of the nature around me and during my multiple trips abroad as well as from the great masters of the past. My goal is not to imitate nature or other artists, but to create a new reality according to my phantasy. In my studio my inspirations get transformed into pictures while I am listening to my favorite classic music (Chopin, Schubert, Mozart, Beethoven) which is another source of inspiration for me.